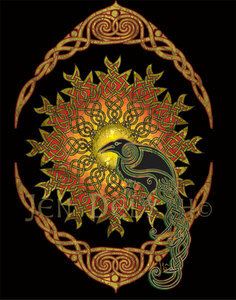 Solstice Raven - for the ancient Celts, the Mysteries of life and death, darkness and light, and the turning of the cosmic wheel were intrinsically connected to their everyday lives. The life giving qualities of the sun - life, light, healing, inspiration, strength, (inner) fire, illumination - were considered divine, and seasonal rituals at the solar Solstice and Equinox festivals, and the four fire festivals, encourage the fertile life-giving force, marking the journey and return of the sun. As life follows death, at the darkest day of the Mid-Winter Solstice, the sun is reborn and the days grow long again, as the longest day of the Summer Solstice, marks the beginning of the slow waning of the sun's power back into the darkness of winter once again. Ravens are attracted to bright shining things, often hoarding them as sparkling treasures, and a Native American creation myth tells of Raven stealing the sun from the darkness, and releasing it into the world. The gleaming black Raven of the Celts is the totem bird of the magical dark goddess the Morrigan. Raven is the carrion eater of death - of the darkness - and is wise in the Mysteries of rebirth. She embodies the divine qualities of the sun with her bright eyes and keen intelligence, possessing a sharp clarity of vision into the shadowy unknown. So Raven is a poetic guardian of the solstice sun as it dies and is reborn once again.